The Family Business is a unique entity that requires strong entrepreneurship, ambitious vision and a sense of urgency; a deep comprehension of strategy, execution and business operations; and a high level of emotional intelligence and business skill. Every family firm is unique and there is not a one-size-fits-all model to address the complexities of each organization. Through Growth Strategies Global, John E. Quinlan works with clients to examine whether their issues are succession, professionalism, governance, and/or performance. He further provides insights into the family dynamics through the exploration and understanding of each individual’s Wisdom Life Chart. Which subsystem is prevailing? Why? What, if anything, should be done about it? 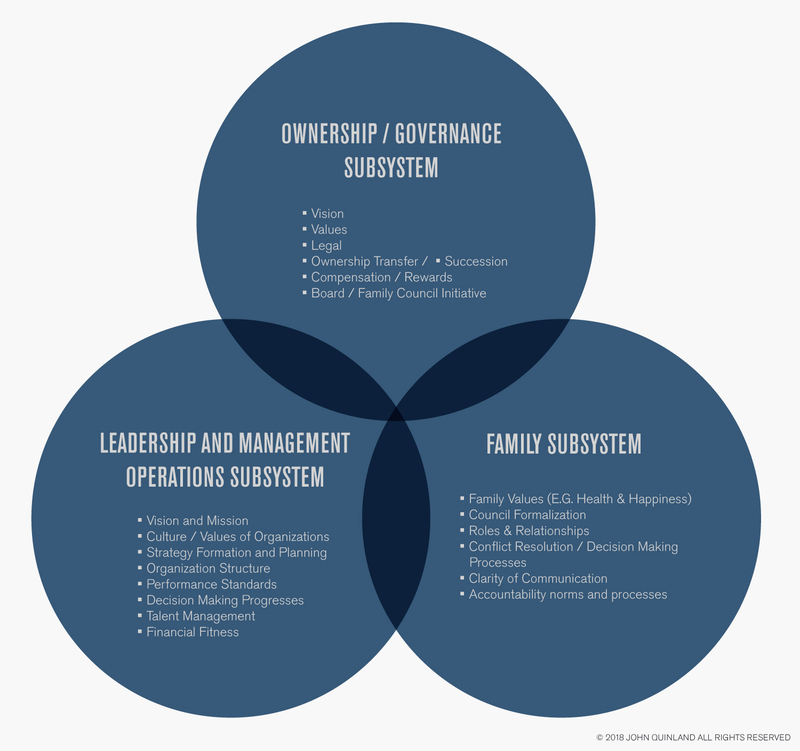 What subsystem(s) should be developed to keep the total family business system integrated and balanced? What functions of the business operations are being undermined by the family issues (and vice versa)? The Family Business (total system) is an organization comprised of three subsystems that are complex and synergistic. The family business leader is responsible for keeping the three subsystems integrated and balanced. A change within any single subsystem impacts the others. John E. Quinlan asks potential family business clients to take a deeper look at their organization before discussing what changes they want to achieve. How does your business stack up? Complete The Family Business Assessment. Reflect on your answers, then call John to discuss the assessment.